Electronic beats and a message of peace from Checkpoint 303. In 1948, the inhabitants of Iqrit, a small Palestinian Christian village in northern Galilee, were forced off their ancestral land by the Israeli army. When the villagers tried to return, the Israeli state bulldozed the village. This is one story among the thousands that make up Palestine’s narrative of the nakba (‘the catastrophe’). Today, the former inhabitants are allowed to bury their dead in Iqrit’s cemetery. 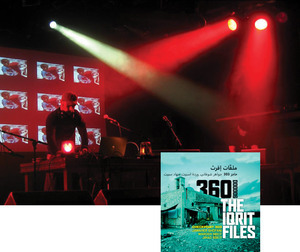 Checkpoint 303 is a collective of musicians, artists and sound designers with an original base in Palestine and Tunisia. Led by Soundcutter MoCha, CP303 has featured in these pages before for its combination of peace activism and electronic beats. The Iqrit Files is its first full-length album, following Checkpoint Tunes (a self-released album recorded between 2006-11 and still available on free download) and it is built around the radical appropriation of the tenet underlying the State of Israel: the right of return. For anyone who has watched and listened to CP303’s rich bricolage over the years, The Iqrit Files does not disappoint. Using oud, beats, political quotes, samples and field recordings, this album is a focused witness against systemic violence. Much of its greatest force comes from the beautiful renditions of traditional Palestinian songs by singers Jawaher Shofani and Wardeh Sbeit and poet Jihad Sbeit that were recorded in Iqrit itself. With a handsomely illustrated brochure that gives, in Arabic and English, lyrics and the unadorned facts of Iqrit’s recent history, this is a fine work. Sound and song have often been about yearning and memorialization, but never has the mix been more poignant. Here is an album to break your heart. Dubulah and Ahetas, challenging musical clichés. It’s hard not to hear this highly individual album as the voice of Greek tragedy echoing through the past to the tremulous present of the austerity-pressed country. Greek composer, artist and painter Ahetas and the Anglo-Greek musician Dubulah, the main movers behind Xáos, employ ancient Eastern instruments – the ney and bul bul flutes, the Pontic lyre, to name but three – alongside newer instruments such as guitar, drums and an Arp 2600 synthesizer (in its own terms, an ancient and lovely machine) to draw the lines. Ten years in the making, Xáos is billed as a post-Troika trance album. Certainly, Dubulah (aka Nick Page), an electronics-orientated musician and programmer with a background with Transglobal Underground and Dub Colossus, has a wealth of experience in the creation of some of the more interesting sounds of the club scene; but a post-Troika album? While Ahetas, Dubulah and their assorted musicians are absolutely correct in demonstrating that Greece is so much more than the emptiness of its coffers, they have also made an album that stresses the wonderful continuity of sound textures through history and to the future. (And track titles such as ‘Antigone in Syntagma Square’ accentuate this flow.) 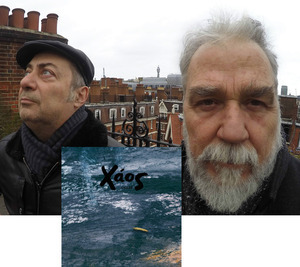 Xáos is an instrumental album, with a pleasing, floating ambience that favours melody over rhythm, but its title does not refer to political realities so much as the primal, mythological, creative soup of chaos – from which all things are made.